NASA Earth Observatory image by Lauren Dauphin, using MODIS data from LANCE/EOSDIS Rapid Response. Caption by Adam Voiland. 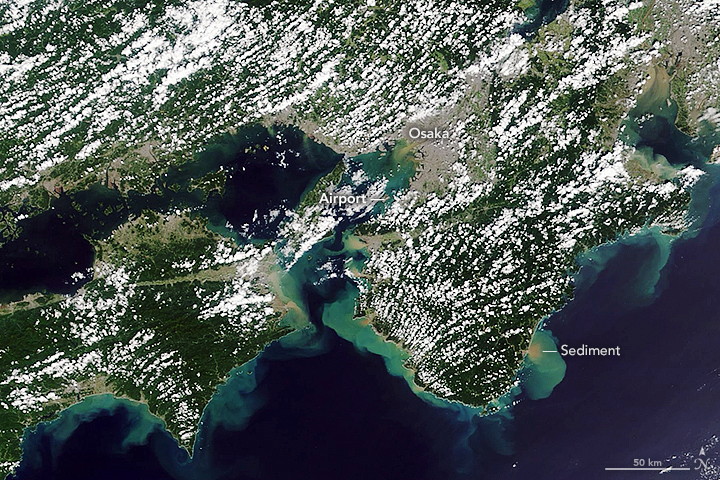 A day after one of the strongest typhoons to hit Japan in decades slammed into Honshu, the clouds had cleared and sediment swirled in Osaka Bay and elsewhere along the island’s southeastern coast. 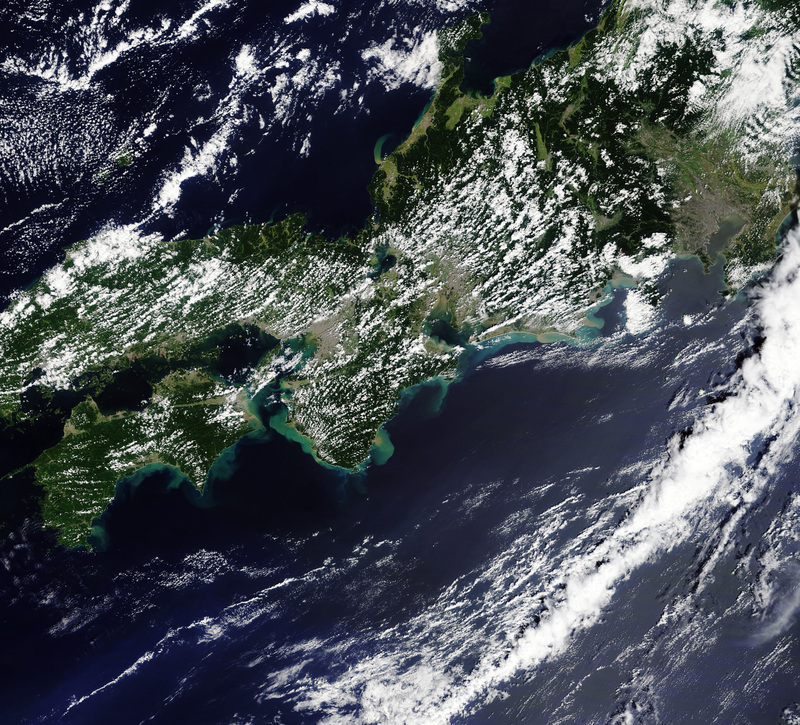 On September 5, 2018, the Moderate Resolution Imaging Spectroradiometer (MODIS) on NASA’s Terra satellite acquired this image of Osaka Bay and the Kansai region. Note the brown plumes of suspended sediment at several river mouths pouring into the sea and fading to teal as the sediment-rich water mixed with sea water. According to news reports, floodwaters have partially inundated Kansai Airport, prompting officials to suspend operations there. Some of the airport’s runways have flooded, and a ship crashed into the bridge that connects the airport to the mainland. Quartz (2018, September 5) The chaos left behind by Typhoon Jebi, seen from the air. Accessed September 5, 2018. The Japan Times (2018, September 4) Typhoon Jebi, most powerful to hit Japan in 25 years, leaves trail of destruction in Kansai region. Accessed September 5, 2018. The Mainichi (2018, September 5) Kansai Int’l Airport may remain closed for a week: officials. Accessed September 5, 2018. The Weather Channel (2018, September 3) Powerful typhoon slams into western Japan. Accessed September 5, 2018. Weather Underground Jebi. Accessed September 5, 2018.